Ousted Ukrainian President Victor Yanukovitch has resurfaced five days after being ousted as president of the beleaguered East European country. He issued a detailed statement released by the Russian Itar-Tass news agency claiming he is still the legitimate elected President of Ukraine and that events leave him no choice but to attempt to restore order there. Yanukovitch’s statement didn’t disclose where he was but based upon his request for Russian personal protection against what he called “extremists”, it is assumed he is either in Russia or soon will be. No Russian official has yet confirmed Yanukovitch whereabouts or his intention. Meanwhile, tensions on the heavily Russian Crimean Peninsula have escalated dramatically in the past several hours as pro-Russian demonstrators stormed the regional parliament building in Sevastopol to raise the Russian flag over the Ukrainian region. The Crimean peninsula, which juts out from what is today Ukraine, into the Black Sea, was always part, first of Imperial Russia, then the Soviet Union. In 1954 the USSR ceded the region- then administered as part of the USSR’s Russian Republic, to Ukraine, then an integral part of the USSR. The strategically pivotal region remains home to Russia’s formidable Black Sea Naval Feet. The Crimean population is heavily Russian and supportive of Moscow. Meanwhile, NATO Defence ministers meeting in Brussels issued a unified message today urging Ukrainian political forces of both sides of the recent divide to work to insure the political integrity of the country. NATO Secretary General Anders Foh Rasmussen urged Russia not to do anything that would raise tensions or “create misunderstanding” in the region. 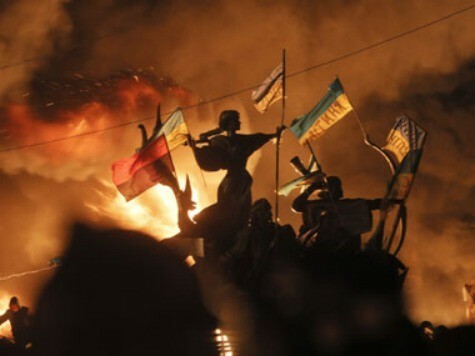 Ukraine has been caught between the West and Russia since the collapse of the Soviet Union in 1991. In 1997, NATO established a special commission with Ukraine to oversee an improvement in relations and cooperation between NATO and Ukraine that in 2008 resulted in an expanded agreement opening the path to possible NATO membership for Ukraine, but that agreement was subsequently shelved. Months of political turmoil in Ukraine have left Europe’s largest country on the verge of bankruptcy and economic ruin which lead to the political eruption that ousted President Yanukovitch from power last week. In exchange for desperately needed emergency financial lifeline of at least $40 billion, the IMF and other Western financial institutions are expected to demand fundamental, far reaching and painful reforms of Ukraine’s corruption ridden economic and political systems.